Although, the mobile phones now a days comes with large storage capacity, still everybody is worried about the free space available in the phone. They never understand, why the space is getting occupied so rapidly. People having the technical knowledge about the whole happenings are easily getting out of this, what about the people who doesn’t have the technical knowledge. Not only the space, people realize that the phone performance is getting lower and lower, day by day. Actually, there are many processes working in the background of the phone, which creates the junk files, cache files, picture thumbnails etc. To improve the performance, free up some storage capacity, we have to delete the unwanted files on a regular basis. Now the question arise for the non-technical people, how to delete them ?. Don’t worry, Today we are here to discuss the easiest method to Delete Duplicate Photos from the Mobile Phone. You will be surprised to see the actual space these duplicate picture files are occupying on the storage device. Many of the people will be wondering about the Duplicate Image files thing. For their easy understanding, While clicking the photos / pictures in the mobile phones, are you people perfect enough to capture the desired one at your first attempt 🙂 . Actually, nobody is perfect in this act, everybody gives at least 6-7 attempts to get the desired photo. Now, what about the pictures files, saved for the wasted attempts ?. Yes, You got it RIGHT, these are the Duplicate Photos, which are occupying the valuable space in the storage device, in addition they are reducing the performance of the Phone too. Let’s throw these duplicate picture files out of the device. Finding and deleting these duplicate picture files is a daunting task, which may consume a lot of time as well as efforts. To make it simple, there is a fantastic app available, named as “Clean Master“. To tell you the truth, this app is a must have app for the mobile phone users. It can free up the storage space by deleting, junk files, cached files, temporary app files and off course the duplicate pictures files too. In addition to this, you can use it as a Phone Booster, Antivirus and Battery Saver. It also have an inbuilt App Manager, to uninstall or backup the installed applications in the mobile phone. The Whats app lovers will find the “Clean WhatsApp” feature more than helpful, as it can delete the selective picture & video messages with some simple TAPS to the screen. You can anytime use the packed “AppLock” feature if there is any need for the privacy. In simple words, they have provided all essential tools under the same roof. Here comes the main part, finding and deleting duplicate photos using “Clean Master” app. Below are the complete steps about all the doings. To demonstrate the same, we are using an Android Mobile Phone with 5.0 (Lollipop) version installed. 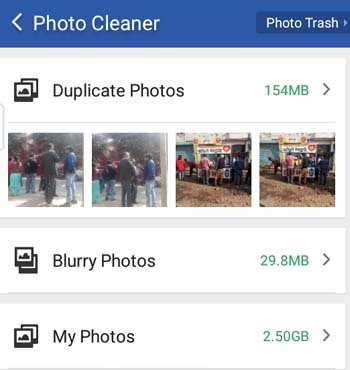 How to Delete Duplicate Photos in Android Phone using Clean Master Mobile app. 1)- Install the “Clean Master” app from the related App Store, if already installed, move to STEP 2. 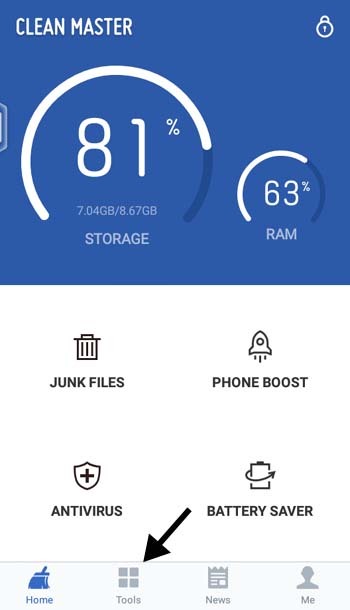 2)- Now, Open the “Clean master” app, On the top of the app home screen, you will get the information about the used storage and memory. Tapping to any of the information, will land you onto the boosting section related to the selection. Beside that, you will have the junk files, phone boost, antivirus and battery saver option. 3)- Now, look for the “Tools” option in the bottom menu, Tap to it. 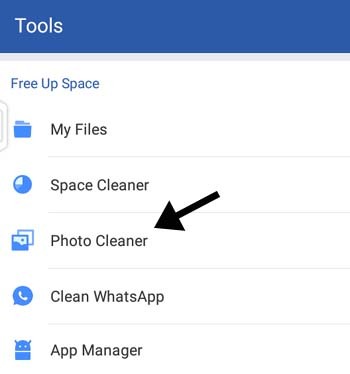 4)- After getting inside the “Tools“, Find and Tap “Photo Cleaner“. 5)- Now, the app will start evaluating the photos in the background, and will come up with the complete information about the Duplicate Photos. 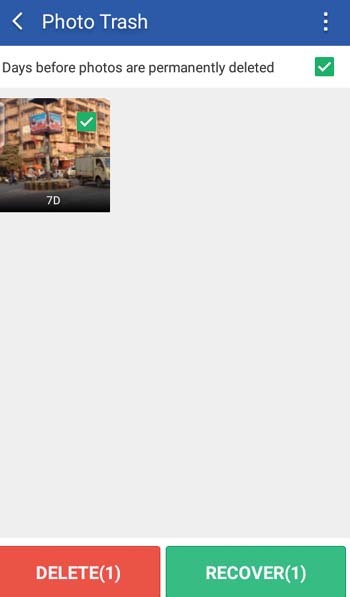 6)- Now, TAP “Duplicate Photos” option and get inside the main window. 7)- Here, on the top, you will see “Retain Best Photos” option. Make sure it is turned ON. 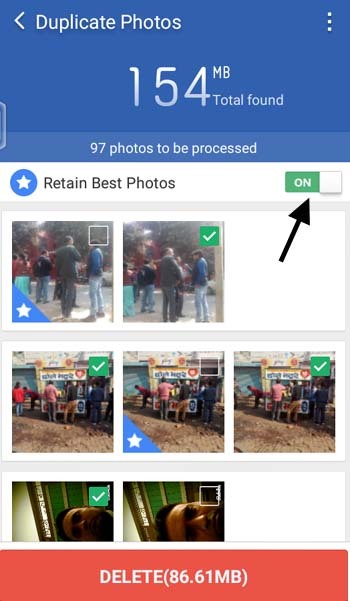 Important: This “Retain Best Photos” is turned to ON by default and will automatically keep the best photo from the certain similar looking photos. Most of the times, it will do perfectly for you. In any special need, you can turn it OFF and manually select the best photo to retain from the “Duplicate Photos” preview window. 8)- Now, HIT the “DELETE” button to move the duplicate pictures to the “Photo Trash“. Congo!, You have successfully removed the unwanted Duplicate Photos from the Mobile Phone. Don’t worry if you have deleted any of the needed photo / picture by mistake. Simple TAP to the 3 vertical dots at the top-right of the “Duplicate Photos” section screen and get inside the “Photo Trash” section. You will get the option to recover / restore the photo you have deleted by mistake. 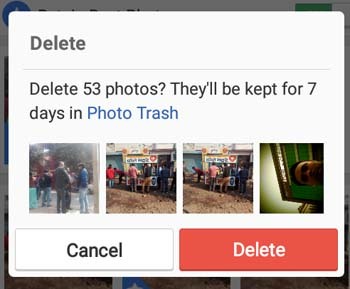 Important: Photos will get auto deleted after the 7 days from the “Photo Trash“, which means you can’t recover / restore any photo after that period of 7 days. 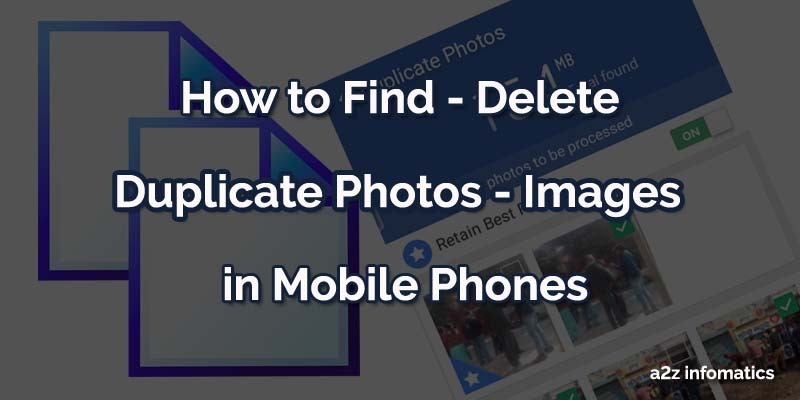 How to Delete Duplicate Photos Permanently from the Mobile Phone. 1)- Open the “Clean Master” mobile app and perform all the steps explained in the previous section to delete duplicate photos. 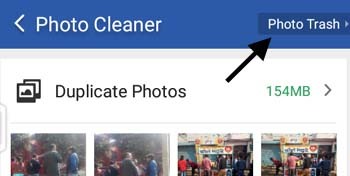 2)- Now, Inside “Photo Cleaner” section, look for the “Photo Trash” button at top-right of the screen. TAP to it. 3)- After getting inside to the “Photo Trash” section, You will be with the option to delete them permanently or restore them. The actual logic “Clean Master” follow to delete duplicate photos. As we were curious to know the logic behind the magic of finding and deleting duplicate photos so easily and quickly, we had performed a research. We found that it’s just a set of wonderful instructions to the system. Actually, to figure out the similar photos / pictures, it compare the files within the same, date / time, file size, file location, internal structure etc. It also uses the Face Recognition technology to filter out the similar images. So Today, you people have learned to delete duplicate photos from the mobile phone. Believe us, this is the only way to delete the unwanted, useless photos quickly and easily. Manual options can be a headache and may consume a lot of time. In addition to this great feature of the “Clean Master” app, it also has many other cool features too. We repeat, this is a must have app for the Mobile Phone. Give it a try, Clean Master app is available for iOS users too, we bet, you are never going to remove it once installed in the phone. That’s all we have related to the subject, we are planning to publish the tutorials for the other “Clean Master” app features too. Subscribe to this blog to get each and every update direct to your inbox. Queries are always invited under the comments section below. Thanks for the readings, keep visiting a2z infomatics.